Joe Arpaio’s Tent City Is Closing, But Will Life for Undocumented Immigrants in Maricopa County Really Change? Maricopa County’s new sheriff says he’ll still work with ICE to detain immigrants suspected of being deportable. For decades, Tent City in Arizona’s Maricopa County operated as a kind of sideshow attraction for the notorious then-Sheriff Joe Arpaio. The open-air enclosure was opened in 1993, ostensibly to house overflow from local jails. But after 24 years of high-profile publicity—and accompanying scandal—it’s coming down. Billed by Arpaio through the years as a cost-saving measure and then touted as a crime deterrent, Tent City fulfilled neither of those promises. Closing the underutilized facility, Penzone said, will, in fact, save the county $4.5 million a year, The Arizona Republic reported. For Maricopa County, the shuttering of Tent City marks the end of an era. It was a pet project of Arpaio’s, the hard-line anti-immigration sheriff who enjoyed inviting media and politicians to tour the premises. 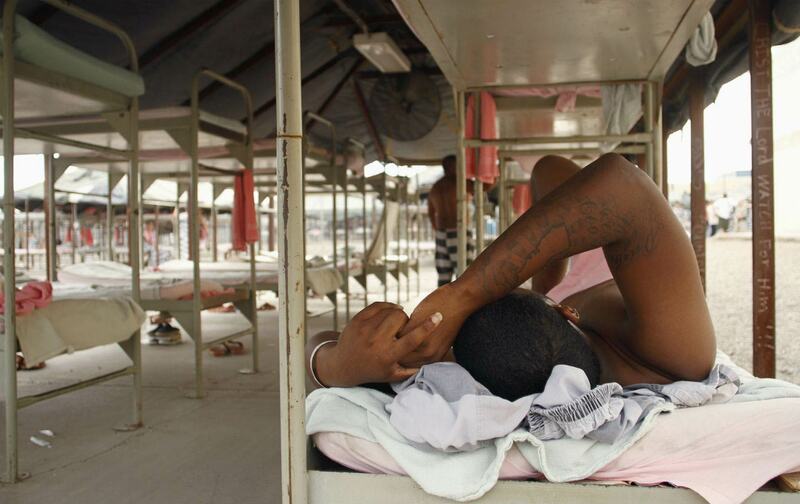 He dressed inmates in pink underwear and clichéd black-and-white-striped prison uniforms. Inmates slept outdoors in surplus Army tents even when temperatures inside reached 125 degrees during brutal Arizona summers. Arpaio was fond of Tent City–focused publicity stunts like when, in 2009, he sent out a press release to announce a parade of 200 immigrants who were made to cross a public street to transfer themselves from a detention center to Tent City, which was itself surrounded by electrified fencing. In 2010, when Arizona garnered international attention for passing SB 1070, at the time the harshest anti-immigrant state law in the country, Arpaio welcomed what he expected would be an influx of immigrant detainees into his jails. He announced a so-called crime-suppression sweep for the day that SB 1070 was set to go into effect, and said he hoped to expand Tent City for the newly detained population. “Why not take advantage of a new law, if the opportunity presents itself?” Arpaio said then. Critics had long called Tent City not only gratuitously humiliating but also inhumane. Arpaio seemed to revel in it all, often responding that he himself had spent a night in the facility and that it wasn’t just the incarcerated who were forced to endure the soaring temperatures. Paid guards patrolled the premises as well, he often said. In recent years, as Arpaio got bogged down in expensive lawsuits over racial profiling and retaliatory actions he took against his critics on the Maricopa County Board of Supervisors, his tough-on-immigrants snarl and his supposedly fiscally responsible policies turned voters away. During Arpaio’s last successful re-election bid in 2012, he narrowly bested Penzone. This past November, after a passionate public campaign to oust Arpaio once and for all, Penzone, a Democrat, won. In January, Penzone hinted that he’d do away with Arpaio’s flashier stunts. “Pink underwear, all that stuff is nonsense to me. How we clothe our inmates, it should just be that we clothe them responsibly, that’s it,” Penzone told The Arizona Republic after the election. Today, just one-third of Tent City’s 2,100 beds are occupied, and the county spends $8.7 million annually to run the facility regardless of the number of occupants. Penzone said that he plans to move half of Tent City’s inmates elsewhere in the next 45 to 60 days, and expects to shut down the facility completely in six months. Civil-rights groups were measured in their praise. “Closing this facility is a good step forward for Maricopa County’s jail system, but there’s still work to do. Maricopa County’s jails are plagued by the mistreatment of pre-trial detainees and remain under federal court oversight because of the ongoing abuse of people with mental-health problems,” Alessandra Soler, executive director of the ACLU of Arizona, said in a statement. And on that, Sheriff Penzone has had a harder time distancing himself from his predecessor. Under Arpaio, when local law-enforcement officers arrested people who they suspected might be immigrants with grounds for deportation, Maricopa County held them for 48 hours in “courtesy holds,” until ICE could make its way over to take people into its own custody. ICE and local law enforcement worked hand in hand, and indeed, under the program 287(g), many local law-enforcement officers were deputized to enforce immigration violations. In February, Penzone announced that he planned to stop the practice of “courtesy holds.” Once people suspected of being deportable were done with the necessary booking and court proceedings, the county would release them. By doing so, the Maricopa County Sheriff’s Office would draw a sharper line between law enforcement and immigration enforcement. This would have marked a serious departure from how Arpaio ran the county. But a week after Penzone’s February announcement and after loud criticism from ICE, Penzone backtracked on the changes. Now the county will hand suspected deportable immigrants off to ICE directly, but from within the county jails, The Arizona Republic reported. There will no longer be any courtesy holds, but only because the county jails will hand immigrants over to ICE immediately now. Penzone, a retired police officer, campaigned on refocusing the county on the fiscally responsible management of the sheriff’s office. Arpaio’s major racial-profiling case ended up costing taxpayers over $50 million. Over his 24 years in office, Arpaio cost the county $142 million in legal fees through various lawsuits. Of course, there’s also the matter of Donald Trump. The Trump administration has called for more cooperation between local law enforcement and immigration authorities, including the expansion of 287(g). And it’s turning up the pressure in other ways. On the campaign trail, Trump frequently promised to “defund sanctuary cities,” and when Attorney General Jeff Sessions rolled out his proposal to do just that last month, that threat took the form of a pledge to withhold some $4.1 billion in federal grant money to jurisdictions that try to distance themselves from federal immigration crackdown activities. There have been some hiccups in the public-relations aspect of that campaign. For three weeks, ICE has released weekly so-called “declined detainer reports” to shame those localities’ law enforcement agencies that refuse to hold on to suspected deportable immigrants for the federal government. On Tuesday, ICE announced that it would temporarily suspend the public shaming over concerns about the accuracy of its record-collecting. In one instance, ICE confused Franklin County in Pennsylvania with other Franklin counties around the country and inaccurately put the locality on its spreadsheet, Pittsburgh’s WESA reported. But the hubbub over withholding funds cuts to a central point: The federal government cannot deport as many people as it wants to without the cooperation of local law enforcement. As it is, the majority of people who end up in ICE custody are not rounded up in raids conducted directly by ICE agents themselves. They’re funneled into the system through interactions with local law enforcement. So while the raids that ICE has conducted as of late have grabbed headlines, it’s through the quieter, workaday patrolling of immigrants and immigrant neighborhoods that people are driven toward the country’s deportation system. And that’s why so many immigration organizers are putting so much pressure on local law enforcement to revise their policies top to bottom. For Garcia and Puente, that means looking ahead to later this week when a Phoenix City Council committee that has been examining police officers’ arrest procedures will discuss the ways that local police interact with immigrants. ICE’s enforcement is facilitated by racial profiling and harassment of immigrants, which makes police officers’ interactions with immigrants so important to focus on, Garcia said. “It’s harder for us to work with ICE directly, so the majority of our resources go to preemptive work,” Garcia said. In that case, Garcia said, that means pushing local jurisdictions to defy Trump, or barring that, reform their own policing procedures.